Crimson (H13) flowers, VIII–X; dark green foliage; has a delicate appearance, and open erect habit; height 31–45cm; spread 46–60cm. Wild-collected sport; found by C. W. Nix (Tilgate, Sussex, England), and introduced by Maxwell & Beale (Broadstone, Dorset) in 1934. White flowers, VII–IX; mid-green foliage; branches less than most lings yet forms a tidy plant; spreading habit; height 21–25cm; spread 31–45cm. Named after Caerketton Hill in the Pentlands, Scotland. Sparse lilac-pink flowers, VIII–IX; golden foliage, tinted red in winter; prostrate; height 10–15cm; spread 21–25cm. Hardy. Named after The Cairnwell, a mountain near Devil's Elbow on the Perth–Braemar road (A90), Scotland. Lavender (H3) flowers, VIII–IX; dark green foliage; forms a prostrate mat; height less than 10cm; spread 31–45cm. Named after the author of first Irish Flora, who came from Threlkeld in Cumberland. White flowers, VIII–IX; bright green foliage; prostrate habit; height 10–15cm; spread 26–30cm. Very like 'White Carpet'. Lavender (H3) flowers, VII–X; emerald green foliage; forms a neat, tight green mound; height 26–30cm; spread 31–45cm. From the USA; introduced to Europe by F. J. Chapple (Port Erin, Isle of Man) by 1960; 'a curiosity sent to me from a reader in California'. Named after the state in the USA whence it came, and its diminutive habit. Foliage dark green; habit very dwarf compact bushy. It is similar to 'Findling', and has not pro- duced flowers up till now. Found c. 1985 by Leif Rapp of Palsboda, Sweden on a mountain called Fulutjallet in Dalarna. ❁ Shell-pink (H16) flowers in short erect spikes, IX–X; dark green foliage; height 30cm; spread 40cm. Found by F. W. Millard (Camla, East Grinstead, Sussex, England) about 1934. Camla is in County Monaghan, Ireland. ❁ Heliotrope (H12) flowers, VIII–IX; dark green foliage; erect habit; height 31–45cm; spread 46–60cm. Crimson (H13) flowers, produced profusely, VIII–IX; dark green foliage; open, vigorous habit; height 26–30cm; spread 46–60cm. Sport on 'Barnett Anley'; found by C. Bouter (Boskoop, Netherlands); introduced by C. Bouter in 1968.; similar in colour to 'Darkness'. Mauve flowers, VIII–IX; bright golden yellow foliage; neat upright habit; height 31–45cm; spread 46–60cm. Found at Carn Nursery, Northern Ireland, as a sport on 'Boskoop'. 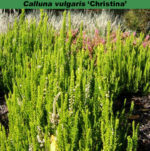 One of the best yellow-foliaged cultivars of Calluna vulgaris. White flowers, VIII–X; yellow foliage throughout the year; slow growing; height 31–45cm; spread 46–60cm. Purple (H10) flowers, VIII–X; mid-green foliage; compact, upright habit; height 31–45cm; spread 46–60cm. Found by Dr Ir T. Visser (Wageningen Netherlands); introduced by W. Haalboom & Zonen (Driebergen, Netherlands) in 1972. Named after Dr Visser's daughter. Rose-pink (H7) flowers, VIII–IX; light green foliage; new growth in spring has pretty yellow and red tips; broad upright habit; height 21–25cm; spread 31–45cm. 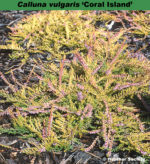 Young plants have coloured foliage in autumn. Seedling; selected in 1992 from seedlings of 'Spring Torch' crossed with other cultivars, at A. Bosch's nursery (Westerlee, Groningen, Netherlands); named and introduced by A. Bosch in 1995-1996. "Cassa" means cash (money) in Dutch – it sells well! Mauve (H2) flowers, VIII–X; golden yellow foliage in spring, turning orange to pale green in winter; compact, spreading; height 10–15cm; spread 31–45cm. Sport on 'Alba Rigida'; found at Graffham, Guildford, Surrey, England, by John Hewitt (Frensham, Surrey) in 1981. Cerise flowers, IX–XI, with grey-green foliage; upright habit; height 25cm; spread 45cm. A seedling raised by C. Harding (Old Hall Nurseries, Puddington, Cheshire) in 1973, and named after his daughter. White flowers, VIII–IX; bright gold foliage throughout the year; open erect habit; height 26–30cm; spread 31–45cm. Seedling; found by John Morris in his nursery (The Lock's Nursery, Scarva, Craigavon, County Armagh, Northern Ireland) in 1985; introduced by John Morris. Name alludes to the foliage colour; Celtic refers to its Irish origins. White flowers, VIII–IX; dark green foliage; upright habit; height 16–20cm; spread 31–45cm. Listed by R. J. Brien (Pitcairngreen Heather Farm, Perthshire, Scotland) about 1990. White flowers, VIII–IX; bright green foliage; height 16–20cm; spread 46–60cm. Very hardy. Introduced by H. Bowen (Falmouth, Massachusetts, USA) before 1993. ❁ Pink (H8) flowers, VII–IX; gold foliage from spring to early autumn then turning greenish gold; compact; height 10–15cm; spread 21–25cm. Sport on 'J. H. Hamilton'; found about 1982 by Kurt Kramer (Edewecht-Süddorf, Germany) and Tessa Forbes; introduced by Plaxtol Nurseries (Platt, Kent, England) in 1988. Named after the Ukrainian city which was the site of a nuclear disaster in the 1980s. This cultivar may be sold under a different name 'Gold Hamilton' which may be treated as a trade designation. ♤ Purple (H10) buds, VIII–I; yellow foliage in summer, turning bronze in winter; broad spreading habit; height 26–30cm; spread 46–60cm. Sport on 'Marlies', found by Peter Herzog in 1997. Lilac-pink (H11) flowers, VIII–IX; grey-green foliage; low-growing, with twisted stems; height 21–25cm; spread 31–45cm. ♤ Crimson (H13) buds, IX–XI; dark green foliage; height 30cm; spread 50cm. Sport on 'Marlies', raised by Matthias Küppers (Straelen, Germany) before 1998, and named 'Christin' but that name is unacceptable because it is a parahomonym of 'Christina' and 'Christine'. White flowers, IX–X; green-yellow foliage in summer, turning to clear yellow in winter; vigorous; height 46–60cm; spread 61–75cm. Similar to 'Serlei Aurea' but the foliage is slightly more yellow. Found in Bremen, Germany, and named after the introducer's daughter. Mauve flowers, XI–I; mid-green foliage with gold/red new growth in spring; height 21–25cm; spread 31–45cm. Raised by Joyce Descloux (New Jersey, USA); introduced by 1998. ♤ Deep purple-red buds, VIII–IX; dark green foliage; low open habit with arching branches; height 26–30cm; spread 31–45cm. One of the earliest bud-flowering cultivars. A wild seedling found in Dyfed about 2 miles from his nursery by nurseryman, John L. Jones, Glynwern Nursery, Cilcennin, Lampeter, Dyfed, Wales; introduced c. 1992. ♤ White buds; IX-XI; bright green foliage; after 3 years 10cm tall, 30cm spread. Seedling, raised and selected by Kurt Kramer. ® C.2009:01 registered on 11 March 2009 by Kurt Kramer, Edewecht, Germany. Pale shell-pink (H16) flowers, VIII–IX; light green foliage; prostrate; height less than 10cm; spread 31–45cm. Found by Dr Charles Nelson at Bridge of Allen, County Clare, Ireland, growing close to 'Caleb Threlkeld'. ♤ Buds pink (H8) to heliotrope (H12); IX-XI; foliage dark green. Sport of ‘Melanie’ found by Kurt Kramer. PBR granted 1998. ♤ Bud-blooming; flowers bright red (hellrot); IX-XI; foliage dark green; habit dense, compact. Deliberately bred seedling; selected October 2000 by Johannes van Leuven. Fantasy name. Registered on 15 December 2002 by Johannes van Leuven. Amethyst flowers (H1), VIII–IX; dark green foliage; compact; height 26–30cm; spread 46–60cm. Sport on 'Darkness'; found by H. Hoekert (Oldebroek, Netherlands) about 1980; introduced by Hoekert in 1983. Purple (H10) flowers, VIII–X; dark grey-green foliage; low spreading habit; height 21–25cm; spread 21–25cm. Flowers, contrasting well with its pale grey downy foliage of the young growth. In cultivation by 1825, at Woburn; it is doubtful whether the present clone is the one grown then. Crimson (H13) flowers in short spikes, VIII–IX; dark lime-green foliage, tipped orange darkening to red-brown in winter; broad erect habit; height 21–25cm; spread 31–45cm. Found by Jos Flecken (Kerkrade, Netherlands) and named after his daughter. Registered 23 December 1993: J. G. Flecken, Kerkrade, Netherlands. Fragrant, "single" white flowers; VI-IX; anthers tan and style-end pink-tinged; flowering on principal shoots and then on axillary shoots. Foliage fresh green, hairless. Spreading plant; after 3 years to 30cm wide; to 15cm tall. ® C.2010:06 registered by Susie Kay; 7 September 2010. Ruby (H5) flowers, VIII–IX; yellowish green foliage in summer, turning bronze-red in winter; height 31–45cm; spread 31–45cm. Name is an allusion to the parent name allegro - con brio is also a musical term meaning briskly. ♤ Bud-flowerer; VIII-XI; buds solitary on very short lateral shoots; composed of 8 calyx segments, c. 4rmn long; corolla and stamens absent; ovary hirsute with shaggy hairs; style enclosed and contorted at apex; foliage more or less glabrous. Wild-collected; found in October 2006 at Letterfrack, Cormemara, County Galway, Ireland. ® C.2009:06 registered on 20 July 2009 by Susie Kay, Lettergesh, County Galway, Ireland. Mauve (H2) flowers, VIII–IX; new shoots are pink like freshly polished copper; summer foliage is yellow-green, turning bronze in winter; upright, vigorous habit; height 31–45cm; spread 46–60cm. Sport on 'Darkness'; found by Mr and Mrs John Hewitt in 1981 in his nursery (Grafham, Guildford, Surrey, England); introduced by J. & E. Hewitt in 1984. Name is an allusion to the foliage. Mauve (H2) flowers, VIII–IX; orange-yellow foliage in summer which deepens to red-copper in winter; stiffly erect habit; height 40cm; spread 55cm. Sport on 'Manitoba', found by Albert Bosch in 1999 in his nursery, Westerlee, Netherlands. ® C.2006:06 registered by A. Bosch, Boomkwekerij Bosch, Westerlee, Netherlands. Lavender (H3) flowers, VIII–IX; soft-gold foliage, tinted orange in summer, deepening to red in winter; height 21–25cm; spread 31–45cm. Introduced by G. B. Rawinsky (Primrose Hill Nursery, Haslemere, Surrey, England) in 1971. Profuse white flowers, VII–VIII; bright green foliage; erect; height 31–45cm; spread 46–60cm. Plentiful white flowers, VII–VIII; light green foliage; height 26–30cm; spread 46–60cm. Keep trimmed. Wild-collected; found near Moniaive, Dumfries, Scotland by John Corrie (Moniaive) about 1930; introduced by Oliver & Hunter (Moniaive, Dumfries, Scotland) about 1938. Named after the finder, John Corrie, a shopkeeper and teacher in Moniave, Dumfries, Scotland, near where it was found. White flowers, VIII–IX; bright yellow foliage throughout the year; spreading habit with erect stems; height 26–30cm; spread 31–45cm. Found by Major-General P. G. Turpin, a past Chairman of The Heather Society, in his garden at West Clandon, Surrey, England, in 1974. Named after the Turpins' house. ❁ Large, shell-pink (H16) flowers, VIII–X; mid-green foliage; low, compact habit; height 21–25cm; spread 31–45cm. An excellent plant found at Lough Dan, County Wicklow, Ireland, in the 1920s. White flowers, VIII–IX, on lateral shoots as well as main stems; mid-green foliage; stiff upright habit; height 26–30cm; spread 31–45cm. 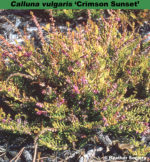 Wild-collected; found on Craig Rossie, in Ochils, behind Auchterarder, Fife, Scotland by R. J. Brien (Pitcairngreen Heather Farm, Perth, Scotland) by 1968. Named after the hill on which it was collected. Mauve flowers, VIII–IX, with orange foliage in summer deepening to bronze green in winter. Low open habit; height 26–30cm; spread 31–45cm. It was introduced by Crail Nurseries, Newstead Abhey Park. ❁ Deep magenta (H14) flowers, IX–XI; dark green foliage, tinted bronze in winter; height 31–45cm; spread 61–75cm. Found by Mrs Simpson Hall (Barnton, Edinburgh, Scotland) in 1963; introduced by Dr & Mrs Simpson Hall. Named after a village east of Edinburgh, Scotland. White flowers, VIII–IX; bright green foliage, young shoots tipped cream in spring; vigorous upright, angular shoots; height 31–45cm; spread 46–60cm. A plant of Dutch origin, similar to 'Spring Cream'. Pale purple (H10) flowers, VIII–IX; gold foliage turning orange-red in winter; height 21–25cm; spread 31–45cm. Introduced by C. Benson (Preston, Lancashire, England) before 1977. Name is an allusion to the flowers. Deep lilac pink (H11) flowers, VIII–IX; yellow-gold foliage, deepening to orange in winter; broad spreading habit; height 16–20cm; spread 31–45cm. Found about 1970 and introduced about 1977 by J. F. Letts (Westwood Road, Windlesham, Surrey, England). Name alludes to the flowers and foliage colours. White flowers, VIII–IX; light yellow-green foliage throughout the year; height 26–30cm; spread 26–30cm. The foliage which develops beyond the flower-spike looks like a crinkly or crisped tuft. Mauve (H2) flowers, VIII–IX; dark green foliage with cream, orange and red new growth in early spring; open erect habit; height 26–30cm; spread 46–60cm. 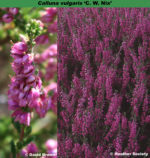 Lavender (H3) flowers, VIII–X; foliage lime-green with copper tips in spring, distinctive copper foliage in summer, turning bronze-red in winter; compact, upright habit; height 21–25cm; spread 21–25cm. Introduced before 1873 when it received an FCC.